The party of Myanmar democracy leader Aung San Suu Kyi, which boycotted last year’s General Election, said today it would contest upcoming byelections, the latest sign of political rapprochement under a new civilian government. Germany has vowed to fully investigate on how a group neo-Nazi right-wing extremists allegedly murdered nine immigrants and a policewoman and carried out a series of bomb attacks across the country for 13 years without being detected. Texters in Pakistan better start watching their language. Occupy protesters took to the streets across America, from Miami to Los Angeles to Portland as thousands of original Occupy Wall Street demonstrators deluged New York marking two months of their movement. Anti-capitalist activists have occupied an empty office block in London owned by Swiss banking giant UBS, their third protest site in the British capital, the movement said today. The Occupy London Stock Exchange movement said a dozen demonstrators gained access to the building in the Hackney area of east London overnight and secured it, adding that they planned to use it as a "bank of ideas." Sri Lanka’s jailed former army chief Sarath Fonseka was today sentenced to spend three more years in prison after a court convicted him for alleging that the brother of the country’s President, Defence Secretary Gothabaya Rajapaksa, had ordered the execution of surrendering Tamil rebels. Former Philippine president Gloria Arroyo was arrested at a Manila hospital today after being charged with vote-rigging, the police said. The 106-member Central Executive Committee of the National League for Democracy (NLD) voted unanimously to register the party, which was officially dissolved last year by the then military regime, and contest the byelections, it said. At a meeting to decide whether to re-register, Suu Kyi told members she was in favour of the party contesting the house seats, but she did not say whether she herself was interested in becoming a Member of Parliament. “In my opinion, I would like the party to re-register and to run in the byelections in all the 48 constituencies,” she told the meeting, which was attended by reporters. No date has been announced for the byelections but they are expected by the end of the year. The NLD, Myanmar’s biggest opposition force, won a 1990 election by a landslide but the country’s military refused to cede power and for the following two decade suppressed the party’s activities, putting many of its members in prison. The party boycotted the next election, held on November 7 last year, because of strict laws that prevented many of its members from taking part. As a result, the authorities officially dissolved it but it has continued to function and enjoys strong support from the public. Myanmar recently amended a political party law removing a clause barring anyone convicted of a crime from joining a party or taking part in an election, paving the way for those who had served a prison term, including Suu Kyi, to contest the polls. President Barack Obama announced today that Secretary of State Hillary Clinton would visit early next month, the first such trip in more than a half-century after what he said were “flickers of progress” in Myanmar. The decision to amend the party laws was widely seen as a move to bring the NLD into Myanmar’s new legislative apparatus, which has operated more freely than expected and allowed the kind of public debate that was forbidden under the military. Suspicions that some members of Germany’s domestic intelligence service, the federal agency for the protection of constitution, may have supported the extremist cell could not be substantiated so far, according to the Federal Prosecutor’s Office, which opened its investigations last week. Germany’s new chief federal prosecutor Harald Range, who took over his office in Karlsruhe yesterday, pledged to work closely with the Federal Criminal Office (BKA) as well as with the federal and state intelligence services for a thorough investigation into the neo-Nazi terror. A neo-Nazi link with the murder of one Greek and eight Turkish migrants during the period between 2000 and 2006 and the killing of policewoman in 2007 was established by the authorities following the death of two members of the hitherto unknown neo-Nazi cell National Socialist Underground (NSU) in an explosion in their caravan on November 4. The police said the two men, identified as Uwe B and Uwe M, committed suicide after a bank robbery because of fears that they will be taken into custody. The neo-Nazi cell had claimed responsibility for the string of murders as well as for a series of bomb attacks and bank robberies in DVDs found by investigators in a partially gutted house in Zwickau, in the state of Thuringia where the two men were staying with their woman accomplice Beate Z. The police also found the gun used for the shooting of the migrants. Police said the 36-year-old woman set their house on fire to destroy evidences shortly after the death of her two partners and surrendered to the police a few days later. She is currently being held in a preventive custody, but so far she has not made any detailed testimony about the terrorism charges against the neo-Nazi cell, according to the police. Meanwhile, investigators found new evidences to show that the neo-Nazi cell was planning more attacks. A USB stick containing the names of 88 persons and public institutions, including several Islamic and Jewish organisations, was recovered from the rubble of their house in Zwickau. Pakistan’s telecommunications authority sent a letter ordering cellphone companies to block text messages containing what it perceives to be obscenities, Anjum Nida Rahman, a spokeswoman for Telenor Pakistan, said today. It also sent a list of more than 1,500 English and Urdu words that were to be blocked. The order was part of the regulator’s attempt to block spam messages, said Rahman. The Pakistan Telecommunication Authority refused to comment on the initiative. Many of the words to be blocked were sexually explicit terms or swear words, according to a copy of the list obtained by The Associated Press. It also included relatively mild terms like fart and idiot. Scores were arrested in New York on Thursday, and several police officers were reported injured, as protesters fanned out across the city heading toward Foley Square in lower Manhattan and the Brooklyn Bridge. 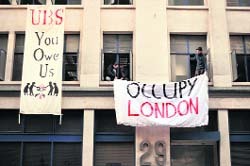 Anti-capitalist activists have occupied an empty office block in London owned by Swiss banking giant UBS, their third protest site in the British capital, the movement said today. The Occupy London Stock Exchange movement said a dozen demonstrators gained access to the building in the Hackney area of east London overnight and secured it, adding that they planned to use it as a "bank of ideas." The London protesters, inspired by the Occupy Wall Street demonstrators in New York, also have camps outside St Paul's Cathedral in the heart of the financial district and in Finsbury Square, also near major banks. "As banks repossess families' homes, empty bank property needs to be repossessed by the public," Occupy LSX member Jack Holburn said in a statement on the movement's website. "We hope this is the first in a wave of 'public repossessions' of property belonging to the companies that crashed the global economy." UBS said it was taking action amid reports that security guards had turned up outside the building. Under English squatting laws, if an empty building can be entered without causing any damage then it can be occupied and the owners must take legal action to evict them. Fonseka, a member of Parliament, was found guilty by a split 2-1 decision by the high court in the ‘white flag’ case, for violating emergency regulations by “spreading rumours and causing public disorder” in an interview with a weekly newspaper. Fonseka, who ran against President Mahinda Rajapaksa in the 2010 elections is already serving a 30-month sentence after a court marshal convicted him on corruption charges. The former army chief was found guilty by the high court for an interview in the ‘Sunday Leader’ alleging that defence secretary Gotabhaya Rajapaksa had ordered the military commander Shavendra Silva to kill the white flag waving members of the LTTE who wanted to surrender before the final battle between the Tamil tigers and the army in May 2009. The charge carried a maximum prison term of 20 years. Fonseka insisted in his testimony that the paper had used his comments out of context, but the court sentenced him to three-year rigorous imprisonment, which means he is expected to perform manual labour. The former army chief faces yet another case in which he has been accused of harbouring military deserters. Rajapaksa and Fonseka fell out after the former removed the latter from the position of the army chief to put him in charge of the joint operations command. The relationship turned sour when Fonseka pitted himself against Rajapaksa backed by the joint opposition. "She's now under the custody of the Southern Police District," Senior Superintendent James Bucayo told reporters outside the hospital after he led a team that served the arrest warrant in her hospital room.